The concert, which questionably seemed to exceed the venue’s official capacity, gave new meaning to the term 360 degrees as the 45,000-plus screaming fans in attendance could see the circular stage from every angle. Non-stop imagery and colors saturated the circular video screen throughout the show’s duration. Mullen’s drum kit revolved during various segments of the show and the band members took turns roaming around the inner and outer circles of the stage, which required us to do a complete 360 numerous times throughout the night’s exhilarating performance. 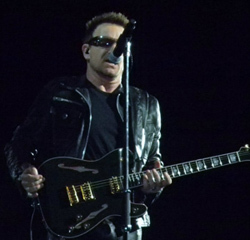 The concert ended with Bono pulling a blind audience member up on stage; he proceeded to play guitar as the band accompanied him on Rattle and Hum’s “All I Want Is You”. Try as I might, mere words cannot accurately describe what it was like to see the world’s largest traveling stage in person and with my own eyes. U2′s Middle Tennessee appearance marked the band’s 100th show of their tour, which turned out to be the ultimate U2 experience, with equal parts luck, timing, and tenacity required to make it all possible. 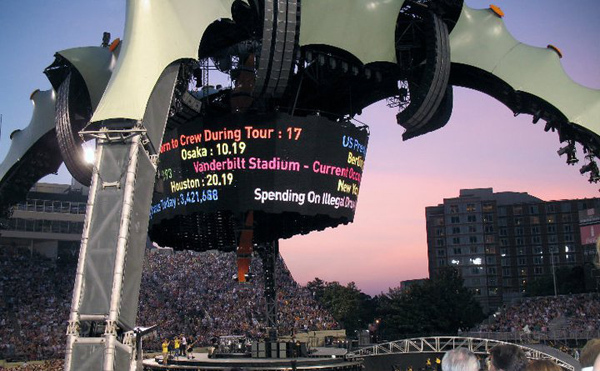 U2’s 360° Tour deservedly holds the record as the most attended and highest grossing tour in history. Having sold over 7,000,000 tickets and grossing an astronomical $736,137,344, nearly every one of the tour’s 110 shows sold out in just minutes after tickets went on sale.